Analog circuit models provided by the circuit simulator Simulation Program with Integrated Circuit Emphasis offer the most accurate behavior of electronic circuits and systems. 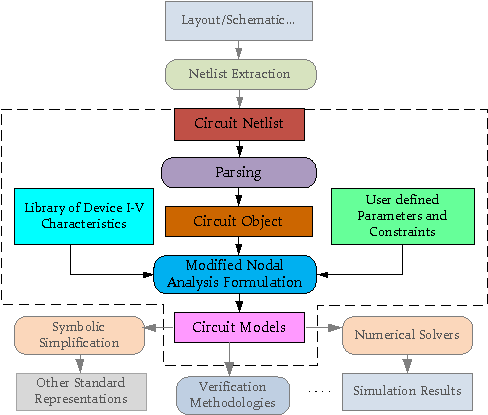 However, those models as well as the program that performs the device characterization are not available for researchers who need to have access to a mathematical description to perform optimization and verification of circuits. Consequently, we need to automatically generate analog circuits mathematical models and provide means to change their model parameters and verify their effects. In this report we present a tool for modeling and analysis of analog circuit implemented in MATLAB Object Oriented. This tool takes as input a Netlist file and generates a circuit object that contains all the circuit elements, their attributes and their connectivity. This circuit object together with a set of library Mfiles that model devices and some user defined parameters and constraints are input to an equations formulation step that implements Modified Nodal Analysis formulation and generates MATLAB Mfiles, used for different circuit analysis.